How do you go about accessing Internet when there is none to be found? Well, one way is to use the solar backpack that ISOM (International School of Ministry) donated to our ministry. Here in Haiti, Internet access is available through 3G cellular connection. The problem is we don’t get that service in the mountains where the poorest people with the least amount of services live and work. By bringing my cellular wireless modem, portable antenna and my solar powered backpack, I’m able to use these components to pick up a weak signal and amplify it into a usable signal. With this technology we can e-mail, chat and maybe even Facebook with a stable Internet connection. It’s not particularly fast but it is something. 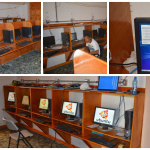 Just another example of using technology to impact the people of Haiti.